Acne occurs when your hair follicles become clogged with oil and dead skin. It’s often associated with the hormonal shifts that come with adolescence and puberty, but can appear during other stages of life. Your sensitivity to acne could also be genetic. In addition to being uncomfortable, acne can have an unfortunate social stigma. Some people with acne have reported that their quality of life has been affected. Some report feeling low self-esteem and social anxiety, interfering with their ability to live each day to the fullest. You are not your acne there are acne treatment options. We look forward to helping you be able to show your face with pride. Products that may trigger acne are called “comedogenic.” Makeup labeled non-comedogenic is less likely to clog pores and contribute to acne. Learn more about our non-comedogenic acne treatment products. The most common form of acne can develop into bumps called whiteheads and blackheads. However, more severe cases of acne can appear in other forms. Use the slider below to learn more about the types of acne, their severity and treatment. Whiteheads, white bulbous bumps, and/or blackheads, darkened oil in an open pore, appear on the surface of your skin. Mild acne can be treated and managed with proper skincare techniques. Use gentle soaps and moisturizers. Rezamid Acne Lotion by Summers Labs can help heal, prevent, and conceal mild acne. Papules, which are small, irritated, reddish bumps on the surface of your skin, and pustules, which look like whiteheads with red irritation around them, are moderate to severe forms of acne. Both of which become more troublesome if you pick or squeeze them. So hands off! Moderate cases of acne can be treated in the same manner as milder forms, but with more diligence. 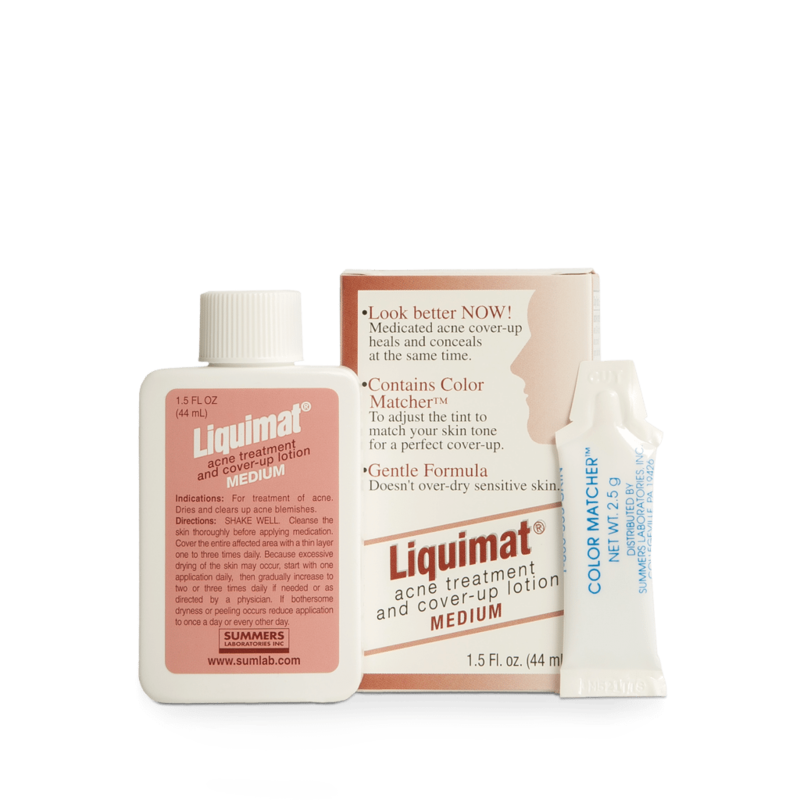 Medicated makeup like Liquimat Medium can also be used in order to help heal while also concealing the flare-ups. More severe forms of acne, like nodules, which are firm and inflamed bumps, or cystic acne, which are large and pus-filled bumps, are painful and a tougher to eradicate with over-the-counter medications. For more severe types of acne that do not respond to over-the-counter medications, you should seek the help of a dermatologist for professional treatment. Ask your dermatologist for details. Whiteheads, blackheads, or more severe blemishes that appear on your face, neck, back, and/or shoulders could signify the presence of acne. How irritated it gets, how persistent it is, and whether it responds (or doesn’t respond) to over-the-counter medications can help determine your acne’s severity. Use the slider above to learn how to identify and treat the types of acne. It’s up to you how you prevent or treat your acne. Whether you choose to treat it, cover it, prevent it, or all three – we can help. Rezamid is a premium, medicated acne lotion combined with a tint-adjustable, water-based makeup. While preventing breakouts, Rezamid quickly dries, heals, and conceals. Whether you have acne or not, it’s important to wash your face twice a day in order to remove excess dirt, dry skin, and oils that can clog your pores – and promote breakouts. During a breakout, avoid wearing foundation, powder, or blush. Some studies link stress with the severity of your acne. Getting in the habit of mindfulness and self-reflection can help reduce the presence of acne. If it’s the stress of acne that’s increasing its severity, let us help you with that.